Meeting our children’s attention needs can be exhausting, especially if we haven’t learned the simple secret that makes giving quality time relaxing, invigorating, enlightening, and fulfilling: Our presence is not only enough, it is better than enough. Child specialist Magda Gerber called this receptive way of being with children “wants nothing quality time.” Others refer to it as “special time.” For me, it was relief. It was a relief to discover that my children were born inner-directed, active self-learners with “play” ideas of their own. They certainly didn’t need mine, which only served to alter and redirect theirs. It was relief to make the switch from being my baby’s entertainer to taking a front row seat as her audience. I already knew what I liked to do and how I saw the world, but every moment I spent quietly observing deepened my understanding and appreciation of her. I was discovering my child. I am a desirable companion. 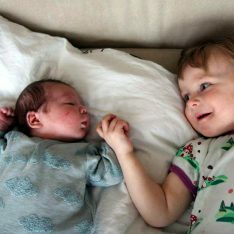 During a recent consultation with Amy about her 3 year old son Liam’s adjustment to their new baby, I recommended a few minutes of one-on-one time each day and, if it was at all possible to arrange, an outing together once each week, which would ensure they wouldn’t be interrupted by the baby. “I was thinking about something you said in our conversation about the “special time” that I spend with Liam. I had commented that it can sometimes feel to me that time is squandered when we spend it somewhere that he’s completely engaged in what he’s doing and not paying any outward attention to me. You said, “But those are the best uses of that time. What a gift to give him, saying, “You are enough, and what you want to do is enough.” What a relief it was to hear that! Hi Janet thanks for this and for all of your posts that I pounce on when I see them appearing in my inbox. I found providing wants-nothing time much easier when my daughter was a baby. She’s now 20 months and when I try to sit quietly with her while she plays she just wants me to read stories, sing songs, or to climb on my lap. I’ve tried doing some of that and then telling her that I’m just going to sit quietly while she plays but it doesn’t seem to be enough. She used to do it so well so it feels a bit frustrating. I’m also not sure whether “wants nothing” should mean that I do everything and anything she wants me to do during this time. In general now she doesn’t like to be left in her safe play space while I do things I need to do either. I think I stopped giving her much time alone as I used to when she started being interested in what I was doing and enjoying helping me, but often I feel like the time we have is now just time while I’m trying to do things I need to do while she tries to get my attention or wants to be more involved than I’m prepared for at that time. Not quality time. I know I’m not getting the balance right here. I have just ordered both of your books but any interim advice would be gratefully received!! I’ve been going through the same thing with my 13 month old son, Alanna. I’m thinking that our role changes in “wants nothing” time as our children get older. I’m taking it to mean that I should be as involved as my son invites me to be, in whatever way he invites me to be, without imposing my play ideas on him. So, if he starts crawling around me playfully and growling (his way to indicate he wants to be play chase), I play chase with him. If he crawls into my lap with a book, I look at the book with him, letting him turn the pages to whatever he is interested in. If he pushes a car to me and says “zoom”, I push a car alongside him. I just try to follow his lead and not take over. If he is content to play by himself, then I just sit and watch. Of course, that is just my take and Janet may have a different opinion. 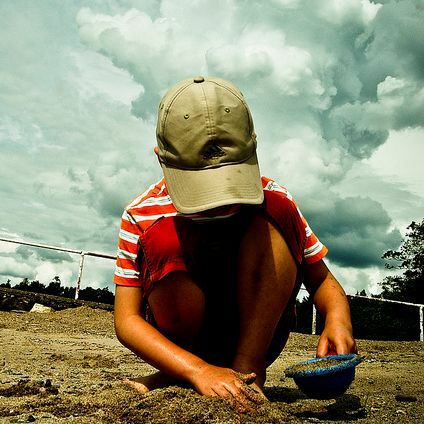 This article was a great reminder for me to be really present during those “wants nothing” times, and I’m hoping that will translate into E being better able to occupy himself in his play space when I need to get my work done. It has always worked in the past, but he has been going through a clingy period lately. For my part, I think I have been responding to his increased neediness by being resentful and only half present with him most of the time, leading him to never really feel satisfied, and thus need more attention. Sorry for the long reply, but in writing this I’ve gained some clarity!! 🙂 Thanks and good luck with your little one, Alanna! Hi Alanna! 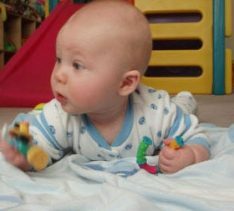 What has changed is that your baby became a toddler, and toddlers have a developmental need to push and push until they find our limits. In other words, your daughter cannot be the one to decide to release you as entertainer. 🙂 You will need to do this…very confidently and calmly, accepting the very strong possibility that your toddler will disagree. Rather than saying, “I will sit quietly while you play”, I would simply define your limit and also lower your expectations. Don’t direct her to play. Let her sit in your lap… There’s nothing wrong with that. That is “being together”. Stay calm. If she wants you to sing and you don’t feel like singing, don’t! Just let her know, “I’ll sing one song and then be done singing for now…” If she complains… “I see. You really want me to keep singing. I’ll sing later at bedtime, but I’m done for now.” Be very decisive and confident. This will allow her to release her testing and feel freer to play on her own. If you have chores to do, let her know… “I’m going to do such-in-such right now. After that, I can be with you again.” Preferably, do these activities at a particular time each day, so that your daughter can accept the routine more readily. It is so easy to get caught up in trying to make everything agreeable to your child. Don’t. She can handle disappointment and disagreement if YOU are confident and clear. Janet, I see what you are saying, but I definitely see value in having a small part of the day when I put my preferences to the side and become authentically available to play E’s way. I think it’s similar to what Dr. Laura Markham talks about at Aha Parenting. It’s another way of connecting and entering E’s world in his way, on his terms. She says, and I agree, that we are mammals and we are designed to play, especially with our young and especially rough and tumble play. I think you disagree w/ her on this issue, but I have seen a deepening in our bonding and relationship when I play with my son in this way, and it makes me feel more joyful and present in all areas of my life. I’ve also found that I feel better about setting boundaries elsewhere, and E is much more likely to easily accept them, when he’s had this special time with me. Our caregiving times are still very important to us and we try very hard to be respectful and responsive in all of our communications with E, but a little silliness and a few belly laughs go a long way towards keeping us all healthy and happy. 1. The parent cannot separate from the child to do the things he or she needs to do. 2. “Playing together” becomes exhausting and draining because the parent feels the need to take an active role. 2. The child does not reap the many cognitive, creative, and psychological benefits of self-directed, indepedent play. Love this. How beautifully written. Thank you! Crystal – you’re so welcome. And, yes, not only enough… better than enough! Thank you for this post Janet! It was such a great refresher of the importance of “wants nothing time” for the adult AND the child. Thank you for also sharing Amy’s beautiful story 🙂 I got goose bumps reading her final comment. It really shows how powerful and meaningful “wants nothing time” is. You’re so welcome, Becky! I found Amy’s words inspiring as well! Thank you for this post. My 2-year old is in daycare full time during the week. I cherish the morning times, like this morning, like when he just wanted to snuggle and be held. The evening times when we play, cook, and get ready for bed. The weekends are great, and even when he is focused and engaged with his Legos or trains. I sit nearby and observe him. (I have been reading your blog for a while so that has helped me.) We went to the park this weekend and he climbed around for a little while with my husband and I, but mostly wanted to watch other kids while being held. Sometimes I wonder if I am doing “enough”, talking to him “enough”, or if he gets bored in our house. Your post helps me be content that my presence and attention is meaningful and as loving as when the times that we are playing actively together. Thanks again! You’re so welcome! And remember that he’s learning quite a bit while observing the other children at the park, so you can totally trust him in these situations. I wanted to thank you for this article, and tell you that I have been thinking about it daily (if not several times a day) since I first read it. I have a 2 1/2-year-old boy whom I adore, but I find myself struggling with a weird kind of boredom when I spend time with him. I have trouble engrossing myself fully in play — unlike my husband who genuinely seems to have as much fun as our son when they play together — and have always felt a bit guilty about it. But looking at it from the perspective of your post, I feel a lot more at ease about it now: my positive, loving presence is enough, I can just *be myself* with him as he plays, and take his cues on how to play along and participate. Thanks again for your insights — I have purchased your new ebook and look forward to reading it. I am so thrilled that this post has helped to ease your mind! 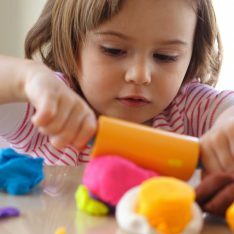 It is not a parent’s job to become engrossed in play with his or her child. That was a big A-HA for me, too. Our job when “playing together” is to pay attention. That is all! Such a helpful thought — thank you for your response! I have now read through your ebook “No Bad Kids” and enjoyed every paragraph. Enlightening and inspiring. Thank you! I wonder if you could offer some guidance for me – I would like my now 7 year old son to be able to play more on his own, even if it is a time when mom and dad are home, as he increasingly asks for us to do something with him. I want him to become more comfortable playing on his own for longer spans of time. Thank you. Where to begin. Unfortunately whenever I read your articles I have an immediate reaction of feeling guilty as to how I am as a mother of two wonderful boys, ages almost 5 years and 7 years old. I hear from my boys that I ‘am always so mean, dad isn’t so mean’. It doesn’t surprise me as I am the one that sets boundaries, potentially more firmly with a firm tone of voice than my husband does. My husband plays with them more. I am the ‘bad’ cop and do chores etc. And here comes the guilt when my kids ask if I could play with them, be it jumping on the trampoline, building lego (which I honestly do not enjoy doing), or a game of memory. I do play with them but not every time they ask me to. I ride bikes with them, go hiking, csmping with them, but I always use a certain tone of voice which I cannot seem to shake off. I feel like I was raised by intimidation…I do not want to raise my boys like that. My point being I am around my kids, I am present, but my mind races to all the things that I still need to do in the day, my kids can very well invent their own games and play by themselves or with each other, yet I feel super guilty that I, alot of the times don’t engage with them. Yet, if I ask if they’d like to bake with me or cook dinner with me they say no. We always eat breakfast and dinner together. I apologize if this is frazzled and potentially doesn’t fit here, but I often second guess how I’ve acted around my boys and what impact it may have on them, having this firm, stern, and hot tempered (and my 5 year old is like me) mom. Parenting two personalities is not easy either, one very sensitive with separation anxiety and the other begins yelling and hitting or throwing objects. To meet both on their level is super challenging. If you have any advice as to improving my ability to be present, or if going on hikes, bike rides, taking them to the skateboard park etc. Is good then I may not be so bad as I think I am.